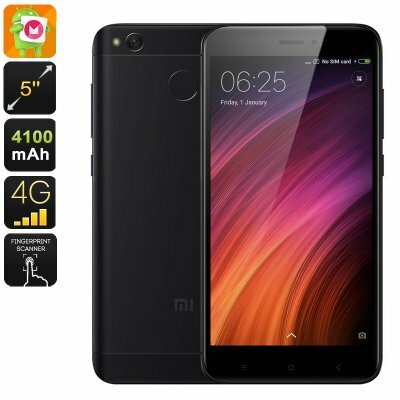 Successfully Added Android Mobile Phone Xiaomi Redmi 4X - Snapdragon CPU, 2GB RAM, Dual-IMEI, 4G, 5 Inch HD Display, Fingerprint, 13MP Cam (Black) to your Shopping Cart. If you are looking for a cheap Android phone that brings along great connectivity, the Xiaomi Redmi 4X is perfect for you. Supporting two SIM card slots and Dual-IMEI numbers, this Android smartphone lets you keep connected to two 4G network providers at once. This brings along great efficiency for those of you that often travel abroad and wish to stay connected to the web at local fares. Additionally, it is great for business people that wish to separate their private and work life on one Android device. No matter where your upcoming adventures will take you next, with this Android phone at your side, you’ll always be within reach of your friends and family back home. Like all Xiaomi smartphones out there, this Android phone features a sleek design that is not only comfortable to hold but also stylish in looks. Within its thin body, this Android smartphone packs the Snapdragon 435 Octa-Core processor. Clocked at 1.4GHz, this piece of hardware allows you to enjoy the latest and most demanding software features available without dropping a frame. Additionally, 2GB of RAM is in place to further increase the powerful performance brought forth by this mobile phone. On its beautiful 5-Inch HD display, this Android phone will treat you with a magnificent mobile experience anywhere you go. At the rear of this beautiful mobile phone, you’ll find a stunning 13MP camera that shoots breathtaking pictures and Full-HD video of all those great moments in life. The phone furthermore has a 5MP front snapper that is perfect for online video calls and taking selfies. Featuring an SD card slot that supports up to 128GB, there will be plenty of space to store all your favorite pictures and videos. This Android smartphone runs on the MIUI 8 interface that treats you with the latest Android 6.0 features. On top of that, it comes packed with an abundance of its own customized features that will further increase your overall user experience. With its 4100mAh battery in place, you’ll be able to enjoy all this stunning Android phone has to offer for numerous hours in a row. Whether you watch movies, play games, or simply make calls and send out messages – this Android smartphone will get you through the day without needing to worry about battery life. This Android Mobile Phone comes with a 12 months warranty, brought to you by the leader in electronic devices as well as wholesale cell phones and gadgets..